Office Sign Company of downtown Fargo, North Dakota has recently purchased an equipment vehicle to enhance their installation capabilities. "This vehicle will help reduce the time it takes for installation and expand their installation capabilities, aligning with Office Sign Company’s goal to take on more exterior sign work in the coming year." Office Sign Company (OSC) has recently made a purchase to further assist their installation process for large exterior sign jobs. Office Sign Company is a global, e-commerce signage company based out of downtown Fargo, North Dakota. They are manufacturers of custom office signs, name badges, conference room signs, and brushed metal door and room signs. Beyond that, they can create custom signage of various forms for customers. To further push their qualifications and diversify their services to customers, an Elliott M43 HiReach equipment vehicle was recently purchased for installation needs. With this new purchase, installations will be safer and more efficient for the OSC installation crew. 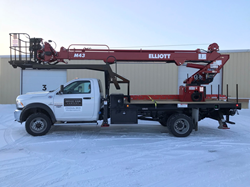 In reference to Elliott Equipment’s name for it, this vehicle will act as an “Office in the Sky” due to the 30” x 54” two-man work platform that rises on a smooth, 49’ hydraulic lift. This vehicle will help reduce the time it takes for installation and expand their installation capabilities, aligning with Office Sign Company’s goal to take on more exterior sign work in the coming year. This new truck will assist in the installation of signage items such as dimensional letters, monument signs, large exterior banners and sign substrates, and more. The vehicle is rated as safe, proficient, and built to last. Look for Office Sign Company’s “Office in the Sky” around Fargo!